What’s the role of voice as a user interface in the smart home? With that question in mind, I eagerly unwrapped the Honeywell Wi-Fi Smart Thermostat with Voice Control, which lets me control a thermostat by shouting (or just speaking). As devices go this one worked as advertised but the overall experience with voice was a bit of a let down, especially given the $349 price tag. You can control your thermostat from your couch. Or maybe your bed, after you are snuggled up under your covers and realize you forgot to turn it down for the night. This is hugely convenient. But it’s not some kind of magical experience that’s likely to get people to trade in their current thermostats like the Nest has. Frankly it doesn’t even have the great design or the intelligence the Nest has (or as good a name). It is programmable and has an app, so if you have laryngitis you can control it with the app without leaving your couch. I put the thermostat next to my existing thermostat downstairs. The review unit was modded with a plug so I didn’t have to install the thermostat to experience the voice capability. So, I can’t speak at all to the ability of the thermostat to control the temperature in my house. 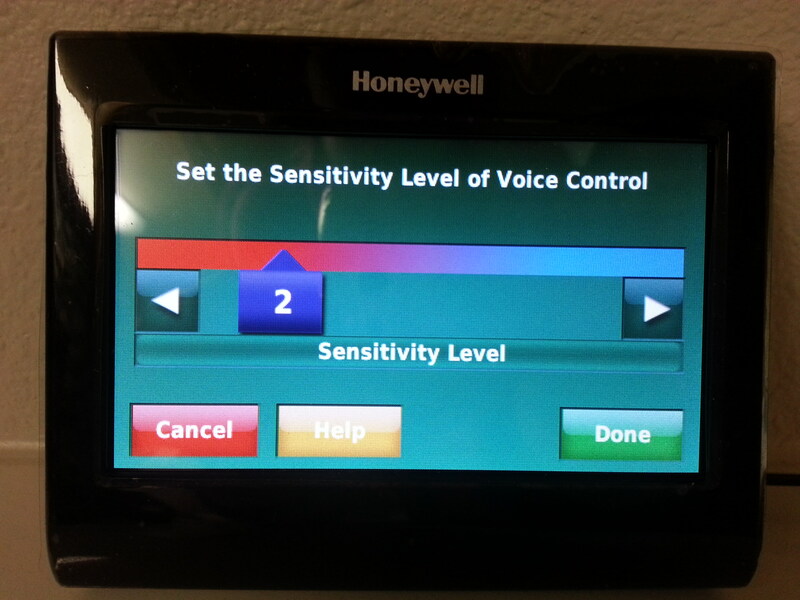 I only tested the voice UI with the thermostat leaning against the wall where my existing thermostat lives. We didn’t pick up the thermostat to test it, since that’s not realistic for a wall-mounted unit. You can set how sensitive the voice recognition portion should be. You can also select the color of the screen to match your decor. So what does the thermostat have? It knows variations on three commands and it can hear them from across our massive common area downstairs as long as I was speaking in a normal voice and facing the direction of the thermostat. It easily understood me and my husband, although it didn’t acknowledge my seven-year-old daughter when she said, “Hello thermostat,” unless she dropped into her lowest register and I increased the sensitivity on the voice recognition to its second highest level. It also didn’t have any problem hearing us over music playing while I was cooking dinner and the accompanying noise — although this wasn’t crazy loud. To control the thermostat, you say, “Hello thermostat,” wait, and then offer one of the acceptable commands, such as “Make it warmer/cooler,” at the prompt. I recorded my exchange with the thermostat below for those who are interested. The prompts are very specific and limited to changing the temperature up or down by varying degrees. It also takes a few seconds between waking up the thermostat, waiting for it to say it’s awake and then issuing the command. I always wanted to tell it thank you after each interaction. The Honeywell marketing people told me that the commands I tell the thermostat are sent to the cloud, where Honeywell might use them to adjust what the thermostat understands. That’s fair, but for people who have grown used to communicating with Siri or Google’s voice recognition, these grammar-based approaches to speech recognition and commands feels like a step backward. This week I also spoke with Jonathon Nostrant the cofounder and CEO of IVEE, which is like a hub for the smart home that lets you control your gadgets via voice, and also uses the grammar-based approach. The benefits to this are that the device can recognize your commands even if your data connection is slow, and it also tends to implement your command faster. The downside is that memorizing a command so you don’t have to get off your couch to turn up or lower your thermostat is neat, but it’s not magic. After talking it over with Nostrant, I’m intrigued by the idea of creating recipes with my Staples Connect Hub that will let me say something like “Hello Ivee, good night.” Then my doors would lock, my lights would go out and my shades would go down. These would spoken commands would essentially be macros I program, but it would get me one step closer to magic. That review unit should be here in a few weeks, so I think then I’ll have a better idea of the role that voice can play. Using voice to set off macros would be great, but basic commands get a little old. In the meantime, I can’t really recommend this thermostat unless you’re just really, really lazy and want to spend $100 more than the Nest for voice control. If that’s the case, maybe get the Nest and the $229 IVEE which will let you work with a variety of other supported connected gadgets. Amazing idea. I don’t see why thermostat should be on the wall too. I don’t understand why people continue to think thermostat boxes need to sit on their walls. Your thermostat should be an app on your phone. There should be a box attached to your furnace/ac/whatever without any user interface, just a connection to the internet. Just like the Chromecast. People shouting at a box located in one location in their house is pretty ridiculous. Every time I see a review of the Nest praising its “appearance” I die a little inside. That’s not a step forward. The app part is, but the thing hanging on your wall will soon be considered mainly as a way to figure out the era a movie/television show is set in. you’ll appreciate our podcast this week. Kevin and I discuss that topic.